Cover art had been revealed for Amazon's upcoming The James Bond Collection. 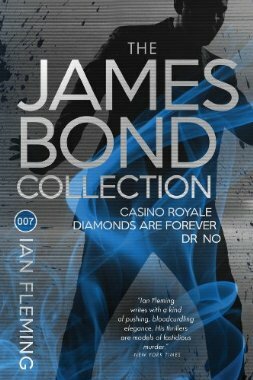 The paperback includes unabridged versions of Ian Fleming's Casino Royale, Diamonds Are Forever, and Dr. No. It's due for release from Amazon's Thomas & Mercer on May 21, 2013. Pre-order The James Bond Collection on Amazon.com. Thanks to W. Perry Bullock and SpyVibe for the tip. Hmmm. An odd selection - why not CR, Live and Let Die and Moonraker? Cover is too busy by half. I've never understood why compilations of Fleming's novels either a) choose such random titles and b) don't put them in the correct order. I've a hardback from St Michaels (Marks and Spencer!) from the 80s (with an unflattering photo of Connery on the cover from the movie of DAF) which has 7 titles, the first of which is Dr.No, the last of which is FRWL, the ending of which is a cliffhanger...resolved in Dr.No! Surely they haven't just gone for the more famous titles - all Bond titles are as famous as each other! At least Penguin got this right when they did their 3 novel collections. Yes, you nearly had me there until you mentioned the hardwood floors. Ha! Yep, those spammers are getting clever. I zapped the comment. Here's the St Michael omnibus I mentioned. Weird ordering, does anyone know if there were licensing reasons why they went with these seemingly random titles? Sometimes the make up of these omnibi do seem odd (especially the ones that put From Russia With Love after Dr. No), but as a (cheap at $11) sample for potential new US Bond readers who want to see what it's all about, this one isn't so bad: The first Bond book, the Bond book of the famous first film, and the Bond book set mostly in America but doesn't have the n- word in it. For a newbie to LitBond, a pretty accessible selection to start off on.